Lochindorb is a large freshwater loch situated high on the bleak Dava moor. A ruined castle sits on an island in the middle of the loch. 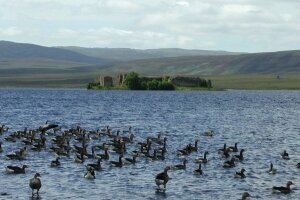 The loch itself is good for Black-throated and Red-throated Divers as well as Greylag Geese. Common Sandpiper, Curlew, Redshank and Lapwing can usually be seen close to the lochside road. Other wildfowl include Goldeneye, Widgeon and Mallard. The surrounding moorland has a typical range of upland bird species including Golden Plover, Wheatear, Skylark and Meadow Pipit.